For when well spent they are saved. And I store them as treasure for death. I wrote that some years ago while walking in Tower Grove Park with my dog, Herb. And, looking back, I can say it was one of the best investments I ever made. Now, semi-retired, I can call on those hours and days which I have stored up for the winter, and one of the fondest recollections I have is an evening in the Summer. The Compton Heights Band was playing in the bandstand, over near the pond, and people were seated all around the grass, some lying there on blankets. That particular evening I had forgotten to bring my lawn chair, so I wandered around on the fringe of the crowd to get a better acquaintance with the audience. I made an amazing discovery. 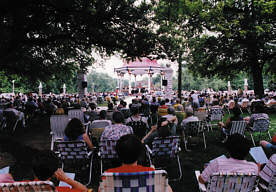 People seated in a park listening to a concert have a great advantage over anyone going to a concert in a hall. There are all kinds of activities going on besides the principal one of listening to the music. The crowd was pretty evenly distributed, half older people over fifty it seemed, and the other half younger couples and their children, and young lovers, finding each other together in the music, some, perhaps, for the first time. On two blankets on the ground there was a family - mother, father, daughter, her husband and baby - eating a light picnic lunch with beverages they had brought from home. And the baby was learning to walk. On another blanket a puppy was learning the tediousness of "staying in place" when its master wanted it to. A short distance away, three young children played a game of Monopoly, very silently, while their parents listened attentively. But, of course, the children were hearing the music too. Close by, an older woman knitted something, probably for an expected grandchild. In a director's chair, a man whom I thought must be an ancient musician, moved his hands as if directing the orchestra with every beat of the band. Oh yes, a concert in the park is much different than in a hall where the walls surround you and confine you and the music, and your actions as well. There in the park, that August summer night, I took in the sounds and the sights, and put them away to bring out on some frosty, cold January day, and warm my soul by their fire. The music played on, and at intermission, gallant men got up (yes, they still do) and brought creamy, cool scoops of ice cream, drumsticks, cold beverages for their partners, and children romped around in civilized fashion as we used to know the word "romp". A very well behaved crowd, a very appreciative crowd, on that sensuous Summer night. After the intermission the band began again and I became quiet, ceased my restless roving on the edge of the crowd and prepared for the magic moment, the moment that happened every evening that I came to the park to listen to the Compton Heights Band. For me that moment is at twilight. The sun is set, and in late Summer the darkness comes more quickly, carrying in it the flickering of lights that were unnoticed before. Suddenly, in a few magical moments, the band stand is illuminated from within with the many little music stands' lamps, lighting the gleaming instruments and warming the musicians' faces. And in the glow of the street lamps the bandstand, the instruments, the conductor, the musicians stand out as a living picture of a century ago. And I see them there just as they stood at that time in another age when people walked to the park and sat on park benches, and that was the highlight of a Summer's day, as it was again that evening. As I stretched out on the grass the magic bandstand appeared to rise in the air above me, suspended there against the black night, an apparition, hovering in the humid, scented air, an apparition that you could only find in Tower Grove Park on a Summer's evening. Then, towards the end of the concert, I became quiet in myself, listening until at last the final piece was played, which is always a stirring march, this one by John Philip Sousa, "The Stars and Stripes Forever". It was a signal to go through my ritual for preserving hours and days. I wait until about halfway through the last piece, then rise and turn my back on the Music Stand and its magic contents. I walk slowly down the path towards the pond, the lighted fountain and the lily ponds, listening all the while to the soaring march, occasionally tossing a glance over my shoulder to see if the apparition is still there. And with the music in my ears, I glance up at the magnificent flag, now flowing lazily in the evening breeze, all lit up and proud. And I amble off into the darkness, listening to the sounds of Summer. We would like to express our deep thanks to Robert Knittel for sharing this experience with us. He has written the book Walking In Tower Grove Park which is available through Amazon.com.